The Hamaori Matsuri in Kanagawa is held on July 16th, 2018. It is also called the Dawn Festival because it starts in the early morning hours and lets you enjoy the sunrise while joining a traditional Japanese festival. In the summer season, you can enjoy various festivals, fireworks, delicious festival food, wearing a yukata and beaches in Japan. But did you ever thought of combining enjoying the beach with a Japanese festival? If you like getting up early to watch the sunrise while sitting on the beach, Hamaori Matsuri is perfect for you. Hamaori is also known as the dawn festival because it starts at 4:15 am along the Nishihama beach in Kanagawa. If you want to know more, this article covers all the information you need to know. Legend has it that the Hamaori Festival started in1839 when the mikoshi (portable shrine) of Samukawa in Kanagawa was lost in the Banyu River. This happened during a fight between the worshippers of the Samukawa Shrine and the ones of the other shrines in the area. After several days, the shrine’s goshintai (the object of worship that spirits reside in) was found in the sea by a fisherman on the Nango Beach located in Chigasaki City. It was returned to Samukawa Shrine and ever since then, the mikoshi of the shrine visits the beach every year. This is the reason why the word “Hamaori” in Hamaori Festival is believed to mean “descent of the gods on the beach”. Around forty mikoshi gather at the beautiful Nishihama beach to celebrate Chigasaki's Hamaori Festival. It is called the dawn festival because the rites begin before sunrise. The festival begins with a procession of mikoshi carried by locals of Chigasaki and Samukawa area. After the purification ritual on the beach, the forty mikoshi depart one by one down to the sea with the carriers and crowds chanting "dokkoi dokkoi", which means "heigh-ho, heigh-ho" in Japanese. They appear to be dancing in the vast sea. In each mikoshi, the deity of a Shinto shrine of the area is believed to ride along. It is a great sight to behold. All the mikoshi enter the ocean for their purification. Entering the sea is believed to welcome the divine with the help of the strength, force and spiritual power of water. The ceremonial purification takes place between 4 am and 7 am. This ceremony ends around 8 am. 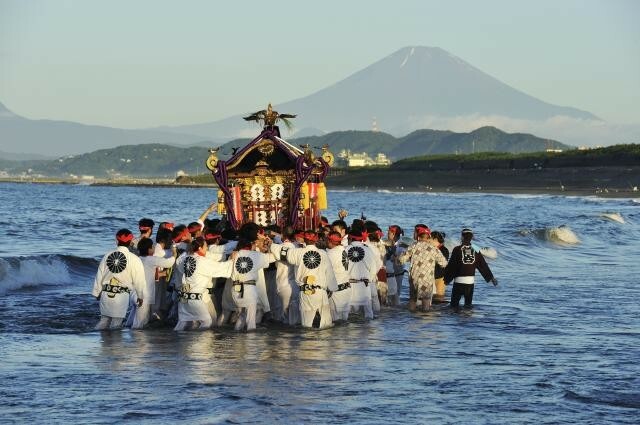 If you want to see the mikoshi entering the sea at once, it is recommended to join at 8 am at the latest. The departure of the mikoshi is called "otachi". The mikoshi begin to float and move all at once. It is simply divine. More than 100,000 people come to the beach every year to see the gorgeous mikoshi being carried to the seashore under the morning sun. The site is filled with people yet still calm with a scenic atmosphere. It is nearly impossible to escape the positive aura spread by the serenity of the whole ceremony. During the festival, you may hear people singing the "Chigasaki Jinku". Jinku is a type of Japanese folk song and each local community has developed their own song with unique lyrics and melodies, handing it down from one generation to the next. Singing the local jinku is believed to have magical powers which encourage the carriers to accomplish their goal. At the Hamaori Festival you can enjoy the morning with some Japanese festival food. The food stalls start selling a variety of food from 5 am in the morning. Hot festival foods, as well as sweets, make for the perfect festival companion. A morning on a beach with a delicious breakfast is what makes the Chigasaki Matsuri more special. The Hamaori Matsuri is one of Japan’s most vivid spectacles with the Chigasaki beach bustling with activity from early morning. The festival is held to wish for a good harvest and indicate the arrival of summer. The mannerisms in carrying the mikoshi differ from shrine to shrine, which makes it an even more unique experience. If you are around the Kanagawa area mid-July you should not miss out on this spectacle! Obon Festival - Join The Celebrations In Yokohama! An Amazing Day Trip To Tochigi - Recommended By The Locals!